Raw jackfruit curry ( palakottai poriyal in Tamil) was new to me until my friend suggested me to try South Indian style jackfruit seed curry/ Palakottai poriyal for rice. Recently we got a big jackfruit from Sendhil’s Periappa’s house from Manakkarai, Kumbakonam. We enjoyed the fruit and reserved the jackfruit seed ( Palakottai in Tamil) for making sambar or puli kuzhambu with it as it has so many health benefits and good nutritional value. This time I asked my MIL for the poriyal recipe and tried it yesterday for our lunch. It came out very tasty. Sendhil loved it a lot. As I cooked this curry in pressure cooker, my job was done quickly.Its ingredients and method of preparation are very similar to Kerala style Jackfruit seed thoran recipe. 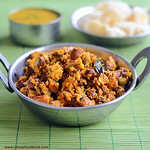 It was tasting good with sambar rice.I am happy that I tried a new Jackfruit seed recipe. Jackfruit season has started in India. So if you buy jackfruit, do not discard the seeds.Try this Palakottai poriyal and enjoy its health benefits. Lets see how to make jackfruit seeds curry recipe. Check out my Kathal Biryani too. Sun dry the jackfruit seeds for a week if you have time. Don’t worry it would stay good for more than a week. Skin can be peeled easily OR Microwave the jackfruit seed for 2-3 minutes in high power. Skin will crackle and seed will become soft, half cooked.Peel the skin easily and chop the seeds into cubes. Heat oil in a pressure cooker. Splutter mustard seeds, urad dal, curry leaves and add the chopped jackfruit seeds.Saute for a minute adding salt and turmeric powder. Grind the grated coconut, onion, sambar powder and cumin seeds to a coarse paste without adding water. Add this paste to the sauteed jackfruit seed. Mix well to coat it. Add 1/2 cup of water, mix well. Pressure cook for one whistle in low flame.Remove after the steam is released. If there is any excess water, boil for sometime to drain it. 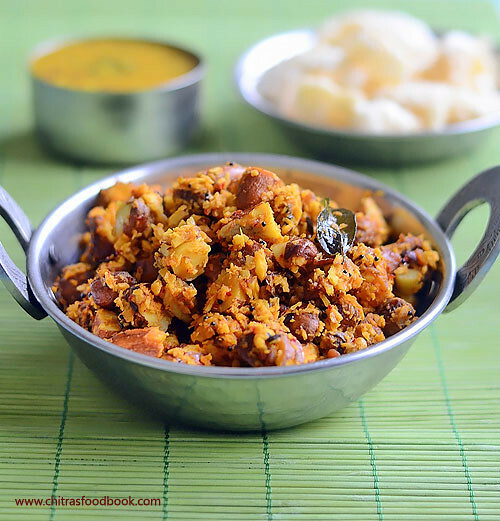 Remove the poriyal in a plate and serve with sambar rice.Enjoy ! Adjust the amount of sambar powder as per your taste. You can replace sambar powder with red chilli powder and dhania powder in 1:2 ratio. 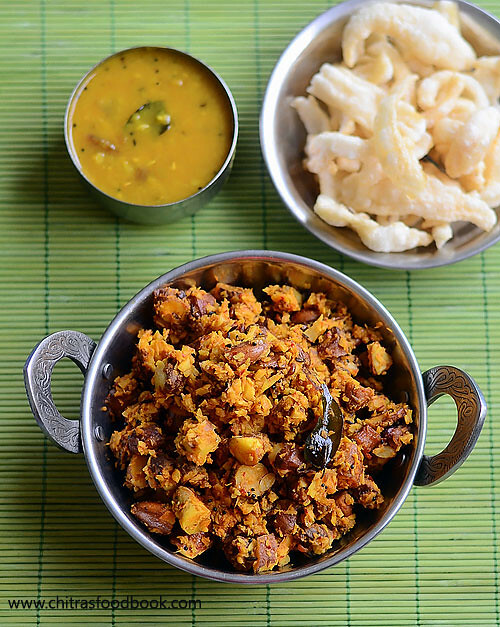 Try this easy and flavorful jackfruit seed curry for Sambar rice and enjoy ! 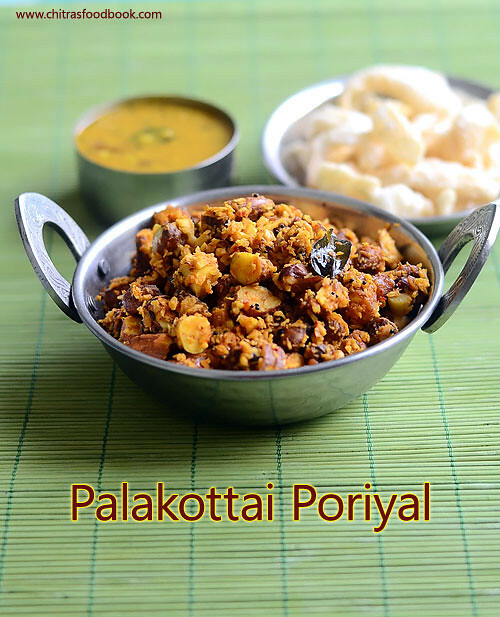 I love palakottai poriyal.My mom makes this poriyal kind of plain, yours with all the masala is making me drool. Worked great! Thanks for the recipe!